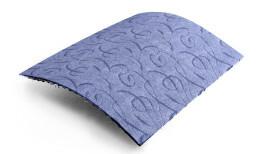 Scroll carpets are produced with tufting technology of white polyamid yarn into the primary polypropylene backing fabric. Carpet design is created through combination of high and low loop. By some designs, high loop is consequently sheared. The pile weight moves within the range of 300- 550 g/m2, according to the carpet type. For the purpose of strengthening of this carpet, the reverse side is modified with the coating base on basis of SBR latex, where one more layer of 100% PP non-woven fabric (felt) is applied. Scroll carpets are coloured with the special technology DYE-GUM.